It's common to have a bad reaction to foods we eat on occasion, such as gas from eating beans or headaches from drinking wine. If you're lactose intolerant you may experience diarrhea when you consume dairy. These are all examples of food sensitivities or intolerances, which are different from allergies in that they are not immune system reactions. With a food allergy, the immune system reacts to specific foods which can result in symptoms that range from mild skin rashes or itching, to anaphylaxis, a serious reaction that can be fatal. In severe cases, the allergic reaction may result in a drop in blood pressure, loss of consciousness, or death. Food intolerance does not involve a reaction of the immune system. For example, lactose intolerance is a common food intolerance. People who are lactose intolerant lack the enzyme (lactase) needed to digest sugar found in dairy (lactose). This intolerance results in gas, bloating, and abdominal pain when dairy is consumed. Some types of food intolerance, including lactose intolerance, can be treated. Over-the-counter lactase tablets can help people who are lactose intolerant to digest dairy, and many lactose-free dairy products are available. To help your doctor figure out if you have food allergies or intolerances, keep a food diary and note what you eat, along with symptoms you experience. Skin tests or blood tests may be ordered to determine food allergies. Food intolerances and food allergies are dealt with differently. The only way to prevent an allergic reaction to a food is to avoid that food. If you are allergic read labels carefully and when in restaurants ask about ingredients in the food you order. A milk allergy is different than lactose intolerance. When one is allergic to milk it's a reaction to milk proteins such as casein. Some people cannot drink cow's milk but might be able to drink goat's milk. Others cannot have any type of milk. 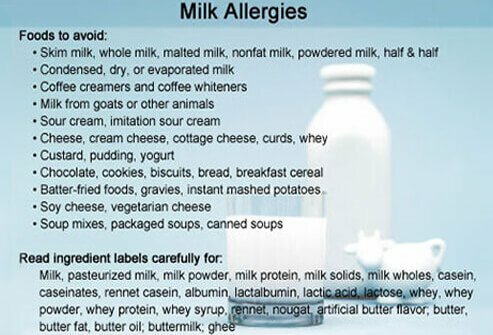 Symptoms of milk allergy include stomach pain, diarrhea, hives, or difficulty breathing. With lactose intolerance, people cannot digest the sugar (lactase) in dairy. They may experience bloating or gas, but not allergic reaction symptoms. Read labels carefully. Aside from milk, look for ingredients such as casein or whey, which are components of dairy milk. They may be found in products you may not associate with having dairy in them such as instant mashed potatoes and baked goods. Egg allergies are usually mild, but can be triggered by small amounts of egg. Some people are allergic to the egg white (albumen), and others are allergic to the yolk. 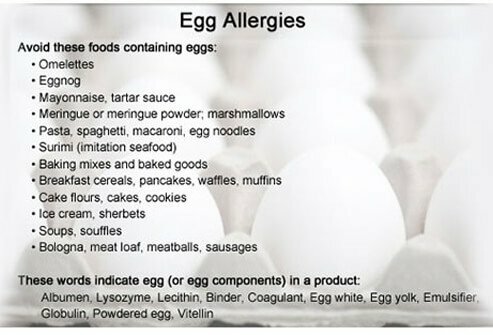 In rare cases, severe egg allergy can lead to anaphylaxis. Read ingredients and look for egg on the list. In some cases when there are only small amounts it may not be listed. Some products state they "may contain" egg or other ingredients. Avoid these products if they cause reactions. 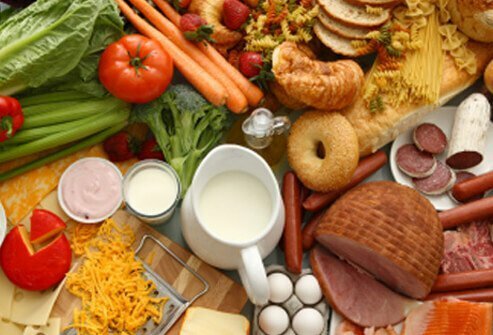 Some foods that may contain egg that might not be readily apparent include some types of noodles, processed meats, bagels, pretzels, and other baked goods. In some cases it may not always be listed on the packaging. Contact the manufacturer if you have questions about how a product is made. 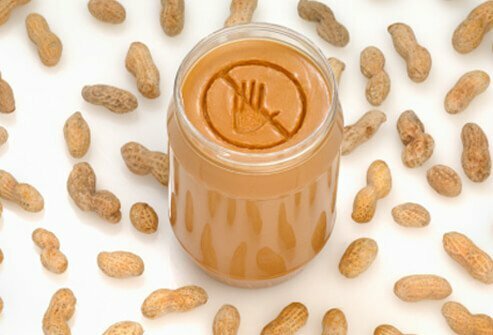 A common food allergen is peanuts, and people with peanut allergies can have severe reactions, which is why they are often banned from classrooms. Some people are so sensitive even shaking the hand of someone who has just eaten the nuts can cause a reaction. In some cases the reaction is so severe the people can go into fatal anaphylaxis. Peanuts are used in a wide variety of foods including ice cream (as a flavoring), marinades, snack foods, cookies, baked goods, and candy. African, Chinese, Indonesian, Mexican, Thai, and Vietnamese dishes often contain peanuts as an ingredient. Peanuts are also used as a thickener in prepared foods, and peanut oil may be used in many fried and prepared foods. Some people with peanut allergies must also be careful of other types of nuts. Peanuts are technically a legume (a bean) that grows underground, but those with peanut allergies may also have allergic reactions to some tree nuts. 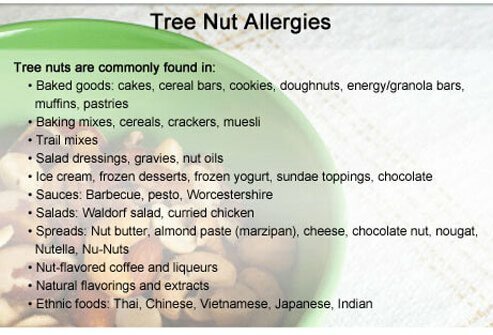 Almonds, walnuts, hazelnuts, Brazil nuts, cashews, pecans, pine nuts, macadamia nuts, coconuts, chestnuts, and lychee (lichee) nuts should be avoided. Read labels and keep in mind that many of these nuts are hidden not just in foods, but non-food products such as lotion or shampoo. 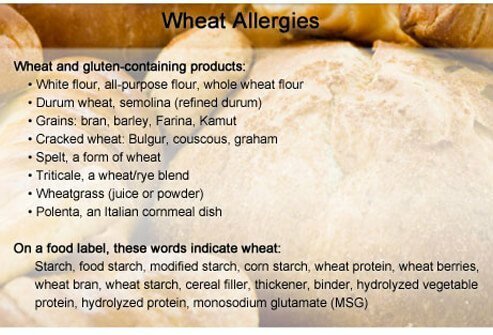 An allergic reaction to wheat is actually an intolerance to gluten, which is a protein found in wheat, rye, barley, and oats. Gluten intolerance is associated with "gluten-sensitive enteropathy" or "celiac disease." With celiac disease, the immune system responds abnormally to gluten and the immune response caused by celiac disease is different than the response caused by other food allergies. Symptoms of celiac disease include gas, bloating, diarrhea, weight loss, fatigue, and sometimes vomiting. 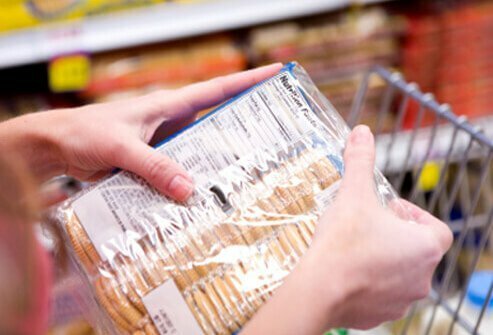 People with celiac disease must read labels carefully and learn which products tend to contain gluten. Even gluten-free bread may contain small amounts of wheat. Wheat can also be found in and ale, beer, bourbon, whiskey, and even wine. Many medications in tablet form have a wheat binder not listed on the label. If you have a wheat allergy, ask your doctor or pharmacist for a liquid form or a tablet that uses potato or corn starch. Soybeans are used widely in food processing. Soy flour can be found in various food products from baked goods and breads, to ice cream, breakfast cereal, frozen dinners, salad dressings, mayonnaise, margarine, sausages, hamburgers, other meat products, and even baby foods. 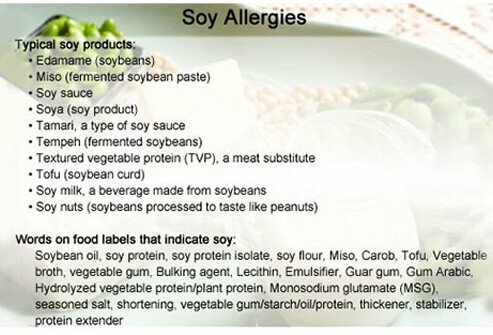 Many of these products do not list "soy" on the ingredient labels, but works such as "hydrolyzed protein," "lecithin," "texturizer," "emulsifier," "protein filler," or "extender" will indicate there is soy in them. 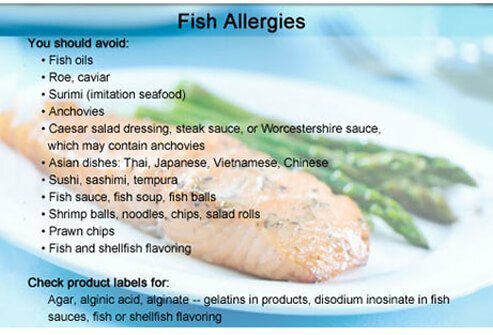 It's easy to avoid fish if you have a fish allergy. When dining out, there is a risk of contamination from other foods. Ask that your food not be cooked on the same surface or in the same oil as fish. 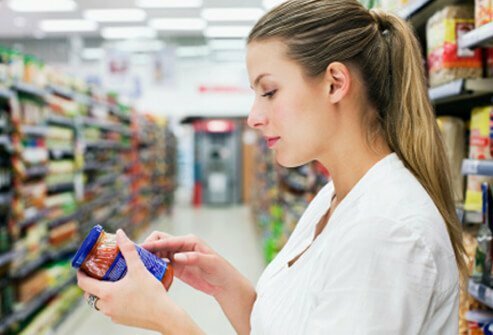 Read labels because some products such as dressings or sauces may contain fish proteins. 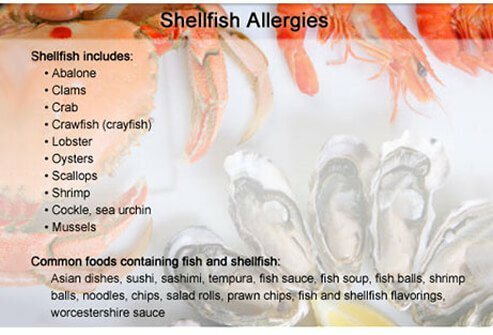 People who have shellfish allergies must avoid all types of shellfish. Often people allergic to one kind of fish have "cross-reactivity," meaning they may be allergic to similar foods. For example, if you are allergic to shrimp you will probably have allergic reactions to crab, lobster, and crayfish. While shellfish is not a commonly hidden ingredient, you will need to pay attention to certain foods. Many Asian dishes contain shellfish. Some imitation shellfish contains flavoring made from real shellfish. Finally, Caesar salad dressing and chili may contain shellfish. To diagnose a food allergy, the first step is usually to keep a food diary. Note what you eat and the symptoms that follow. Next, your doctor will likely recommend eliminating the foods that seem to trigger the allergic reactions. Sometimes a doctor will supervise something called an oral food challenge, where the allergic person is exposed to the suspected food. Other tests may include a radioallergosorbent blood test (RAST) to check the number of antibodies produced by your immune system, which can help identify specific allergens. An allergy skin test, or prick-puncture test, may also be performed to help identify what is causing the allergic reactions. 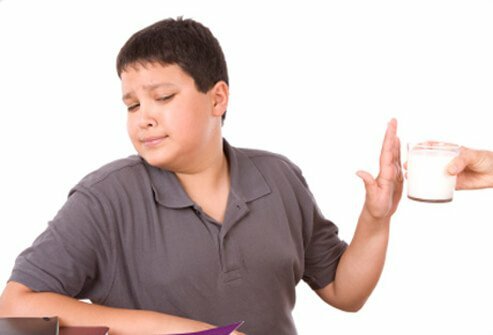 Food allergies are reactions of the immune system to specific foods. 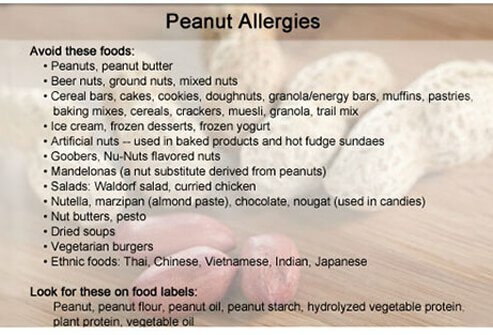 Common foods that cause allergic reactions include shellfish, milk, eggs, and peanuts. Hives, asthma, abdominal symptoms, lightheadedness, and anaphylaxis can result from an allergic reaction to a food. A doctor will determine whether the reactions to the trigger foods are actual allergies or food intolerances, which are more common and treated differently. Once the specific food allergies are identified patients can work with their doctors to manage their allergies. UpTodate: "Patient Information: Food Allergy Treatment and Avoidance (Beyond the Basics)."